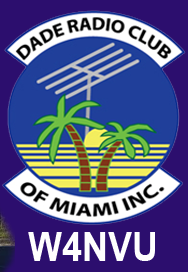 July 2013 Meeting Minutes – W4NVU – Dade Radio Club of Miami Inc.
Miguel presided over the meeting and welcomed everyone. The meeting was not broadcast live on the air tonight from the EOC. There was testing being conducted in another room tonight. Everyone took turns and stated their name and call sign and what they did Ham related since the last meeting besides Field Day. Miguel welcomed everyone again. Miguel reminded everyone present tonight to sign in. Miguel announced that we were having a raffle tonight of 5 connectors for coax and a hat. One ticket for $2.00 and 3 tickets for $4.00. Please see Miguel. While the meeting was going on, Miguel showed photos of Field Day and of the Hurricane Conference. Corresponding Secretary – Lloyd advised that everything is OK. Miguel advised that a change of address was filed and we should be getting mail at our new PO Box. Treasurer – Esther is not present tonight. Miguel asked everyone to pay their dues to remain active. Website – News Letter – Ryan advised that everything has been updated. Armando advised that the next Tech class has started. Andy advised that the class is packed. They are going to schedule another Tech class very soon. They have emergency managers from the hospitals, a police officer and 2 fire fighters and some dispatchers. Armando advised that there will also be a net control class coming very soon. Right now the next Tech class being hosted by the Red Cross will be in Fort Lauderdale. Julio spoke about Field Day. It was a great success. All events have been posted. David announced that the Kayak race will take place Saturday, Oct 5, 2013 at 6 AM and the Junior Orange Bowl is in November this year. Dave announced that we had a good test session and Orlando Arias and Jose Sanchez both passed their Tech exam. Congratulations!!! Miguel advised that the Repeater information is online at W4MVU website. All the Ares/Races emergency nets and all the frequencies. With the storm out there, Wednesday would be a good time to check out your equipment and check in. Miguel spoke about D-Star. We are missing some parts, but it should be up in a week or so. Carl reported that on Saturday, June 29 at the EOC we had a Hurricane Conference and great speakers. They are looking for volunteers. On the table there are copies of their QSL cards and reporting sheets. Miguel stated that the Tropical Hamboree’s meeting this month is on the 3rd Monday, July 15 at 7 PM here at the EOC will be the meeting. It will take place next year on January 31 – February 1, 2014. They need volunteers. See Miguel or Jason Swift if you can volunteer. Miguel announced that tonight we do not have a presentation because of a no-show. But Armando gave a Red Cross presentation. Very informative. Thank you Armando. Miguel announced that he received a call regarding the D-Star and the equipment should be done this week. Glenn won the raffle of the 6 connectors and hat. Virgil won a shirt. Congratulations! Ryan made a motion to adjourn, seconded by Carl. The DRC meeting was adjourned at 21:03.